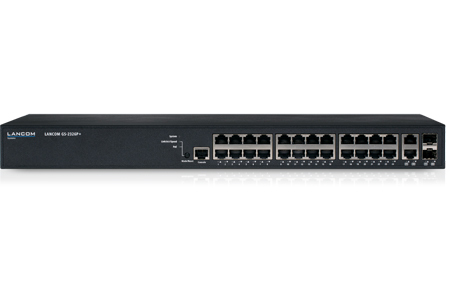 This fully managed switch is the intelligent basis for modern network infrastructures. It networks up to 26 devices with its 24 Gigabit Ethernet ports and two combo ports. Offering Power over Ethernet, numerous security features and a high-performance hardware platform, it is the first choice for secure and reliable networking in medium-sized networks. Orchestrated from the LANCOM Management Cloud, it is configured dynamically, automatically, and efficiently by SD-LAN. 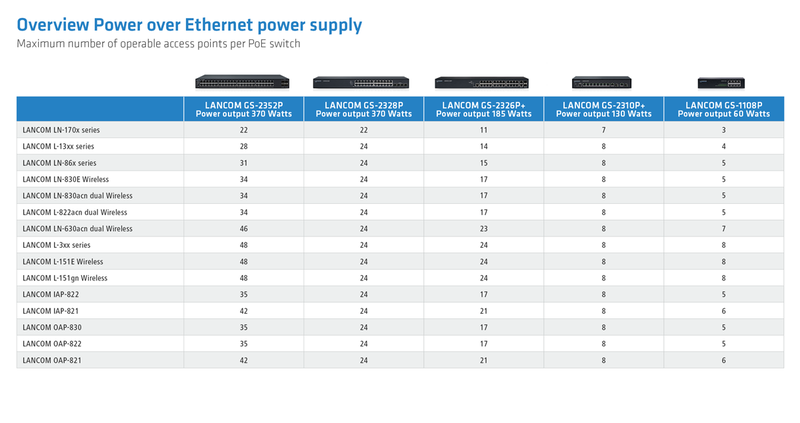 The LANCOM GS-2326P+ is equipped with 24 Gigabit Ethernet ports and 2 combo ports (Ethernet or fiber-optic). With a data throughput of 52 Gbps on the backplane, it offers full performance even under load. This makes the switch a high-performance basis for modern network infrastructures in any industry or field of application. 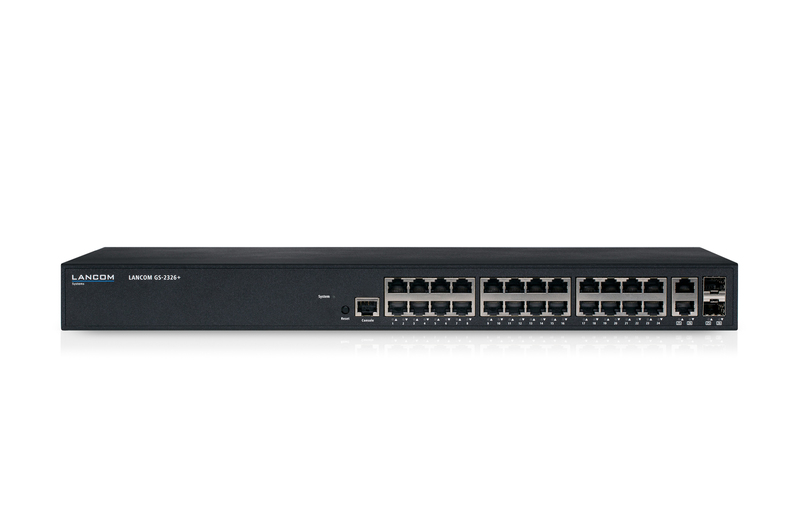 The LANCOM GS-2326P+ is a high-performance PoE switch that directly powers PoE devices connected to it; there is no need of additional power supply units or cabling. It supports the two Power-over-Ethernet standards, IEEE 802.3af and IEEE 802.3at (PoE+). It has plenty in reserve with an overall output of 185 Watts, so it efficiently supplies power to devices with high energy demands. Featuring Energy Efficient Ethernet technology, the LANCOM GS-2326P+ provides optimum energy efficiency even at fast data rates. Thanks to numerous power-saving features based on the IEEE 802.3az standard, ports that are not transferring data are switched off automatically. This valuable feature saves precious resources. The LANCOM GS-2326P+ excludes rogue clients from gaining unauthorized access to the network. This is ensured by secured access control on all ports as per IEEE 802.1X (port-based, single, multi, and MAC-based). Secure communication protocols such as SSH, SSL and SNMPv3 mean that the LANCOM GS-2326P+ is ideal for professional remote network management. The switch also supports the TACACS+ protocol for authentication, authorization, and accounting. This optimized solution promises maximum security for multi-site network management and monitoring. The LANCOM GS-2326P+ integrates seamlessly into existing LANCOM network infrastructures. Network events are easy to monitor with the LANCOM monitoring systems LANCOM Large Scale Monitor and LANmonitor. 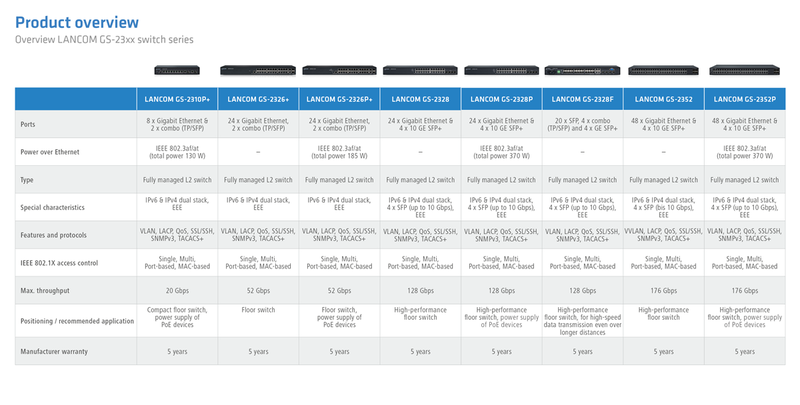 Thanks to the dual-stack implementation, the LANCOM GS-2326P+ operates in pure IPv4, pure IPv6, or in mixed networks. Applications such as SSL, SSH, Telnet, and TFTP can continue to be operated on IPv6 networks. Supported IPv6 features include stateless auto-configuration, the discovery of neighboring devices, and MLD snooping.